Our gray living room has a little modern touch with an elegant carpet, funky teal curtains, and homey and gorgeous accents. It took a couple of months to get everything just right, but I adore the way this remodel came out! I’ve been wanting to update our living room for a long time. 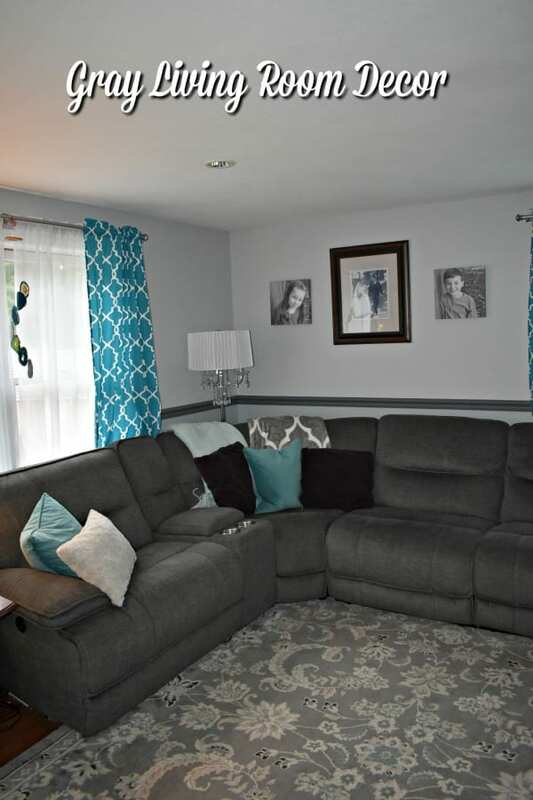 Our couch was sad and lacked support, the carpet stained from toddler mishaps, and the walls were blah with paint colors chosen from a decade ago. 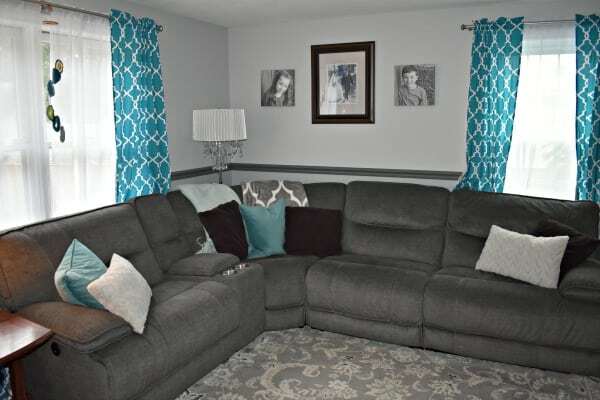 I knew that I wanted a gray living room, something comfortable but elegant. After spending a month looking at paint colors and other ideas, it was time to get to work! It is important to note that I that I am not a professional. The ideas presented here are all my own, unless otherwise credited and I have shared tips based on my experience. I always recommend consulting and/or hiring a professional if needed. Be sure to check with local building codes to obtain all permits required for any DIY project. Please always use all proper safety precautions and be sure to read and follow all manufacturer instructions. Finally, please note that I am not responsible for any outcome if you try this yourself; I am not liable for any injury or additional cost or expense incurred. Changing the couch means not only an updated look, but also lots more seating for our family. This sectional has four reclining chairs that are so comfy! The carpet has just a hint of teal in it, inspiring my accent color. (Check out the rugs on sale at Houzz.) I wanted something that was dark enough not to show wear and tear from the kids, but not so dark that it would make the room feel small. Our photos of the kids are actually wrapped canvas that came from Custom Canvas Prints. They have some great products, and amazing deals, too, like 8×8 Canvas Prints for $4.98. I like using the Premium Plus Ultra from Behr (you can find it at Home Depot) because you can skip using primer (unless you are painting over a very dark color). 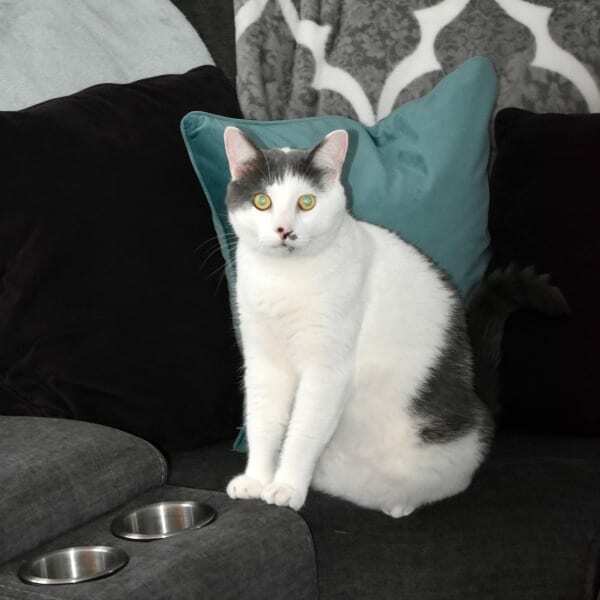 It turns out that our cat, Panda, matches the gray living room beautifully. I swear it wasn’t intentional! To keep the room from looking too dark or monochromatic, I wanted a pop of color in the room. 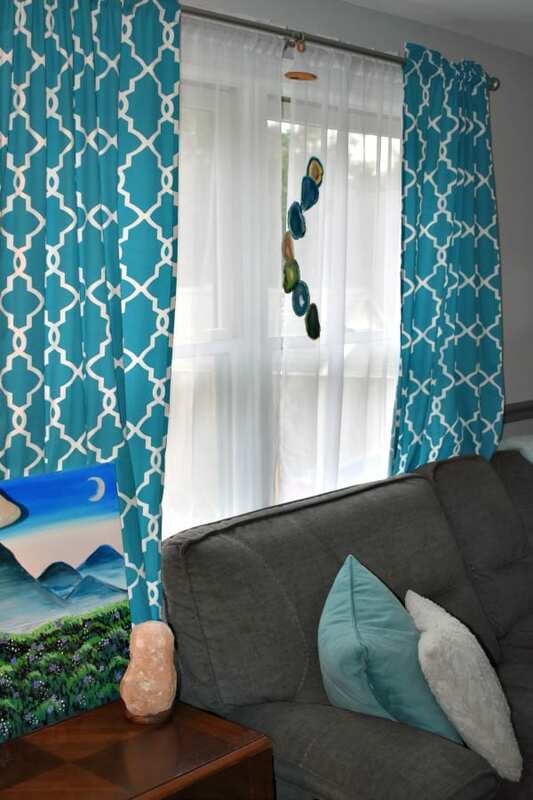 These teal curtains are perfect, and I found coordinating pillows and a throw blanket, as well. The geode wind chime adds so much to the room, not only in color, but every time Panda brushes against the curtains, the geodes create a beautiful noise. I love that the Himalayan salt lamp gives off a warm glow in the room. 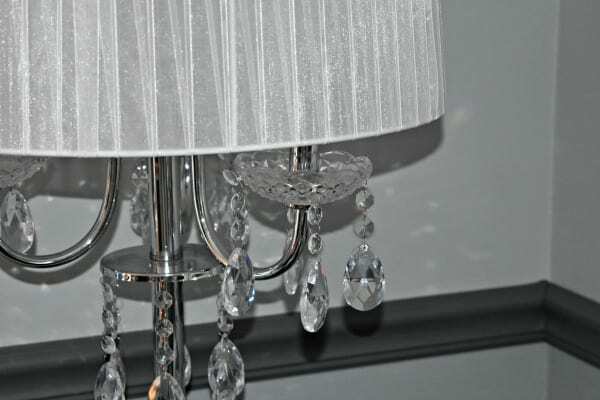 I also wanted to add just a little sparkle to the room and fell in love with this lamp. 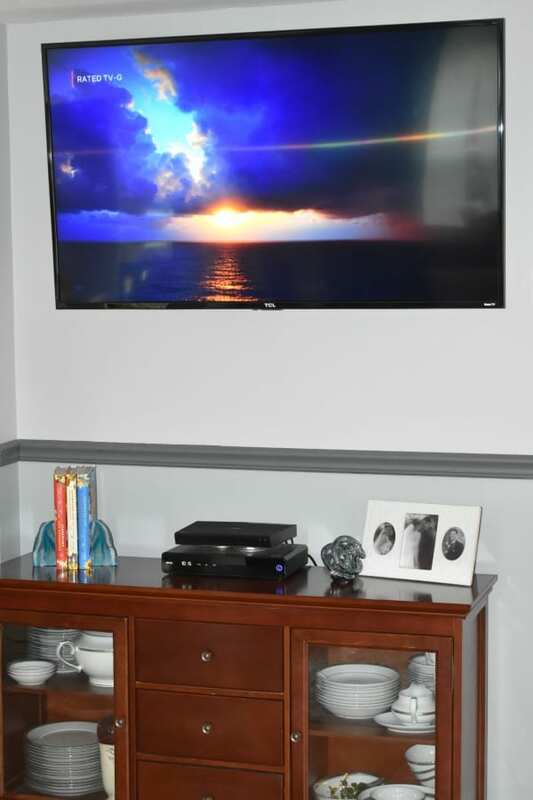 We also got rid of our old TV stand (and TV) and mounted a new TV to the wall, which saves so much space! I also purchased these agate bookends to hold my favorite (Pioneer Woman) cookbooks. 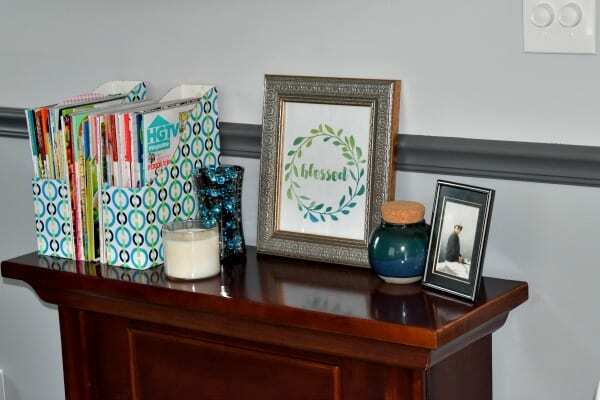 A few more touches of teal and silver here on the mantle help bring everything together. Mr. Juggling Act also swapped our all of our knobs, switches, outlets and plates using bright white. It looks SO pretty! And you are right, the cat is a good match.